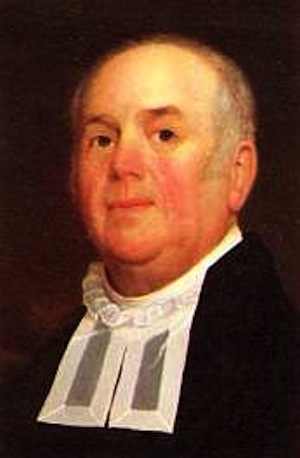 The Reverend William Bentley of Salem, Massachusetts, was much loved by his parishioners for his kindly disposition, his emphasis of good works over theological conformity, and his enthusiasm for education. A graduate of Harvard, he was a lively lifelong learner and teacher; it was said that he spoke 21 languages, seven of them fluently, and his personal library was one of the finest in New England. At the same time, he lived quite humbly, residing for nearly his entire career in rented rooms at what's now known as the Crowninshield-Bentley House in Salem for most of his ministry, which has just recently been restored by the Peabody-Essex Museum, and opened for historical tours). I went to Boston to attend a Committee of the Grand Lodge. Upon my arrival & for a moment's amusement I visited the Learned Pig & the exhibition greatly exceeded my expectations. It was taught to discover the cards, to assort the letters of words, & to bring numbers for any purpose. I afterwards visited Bowen's Museum & tho' the arrangement by no means met my wishes, yet I could select many things to give me pleasure. The wax work is extensive, but I can pronounce nothing. The tapestry obliged my attention. The painting "Death of Lewis," from which the wax work of the same event is taken, was good, but the resignation of Washington interested me. There are many portraits which are interesting. The musical clocks discover ingenious mechanisms but the notes of the clock discribing the Organ & Claronets were captivating. In the menagery was a bear sleeping & slumbering with an insolent contempt of every visitor. A Babboon, more fond of entertaining his guests, an affronted porcupine, & two owls who gave us no share of their notice. And, as it happens, not long after the Rev. Bentley's return to Salem, this pig -- who was in fact William Pinchbeck's original "Pig of Knowledge"-- followed him there. The good reverend did not, so far as his diary indicates, pay it another visit, but shortly after its arrival in May noted that "The Learned Pig does not find great encouragement to stay in Town." This, apparently, was due to the appearance of a "Learned Dog" which performed many of the same tricks, to the great detriment of Pinchbeck's business. * A few weeks later, on May 25th, Bentley noted laconically that "The Pig of Knowledge has left the Town. The Dog went before him." There is no further mention of the Pig in the published Diaries -- though as they represent only a tiny fraction of the whole, one never knows. But that Bentley -- by any measure one of the most learned men of his day (he once turned down an invitation to oversee the University of Virginia) left such a favorable encomium of our learned pig, speaks greatly in his favor. *Customs and Fashions of New England (1894) describes this learned pup thusly: "In 1798, Salem had the pleasure of viewing a "Sapient Dog" who could light lamps, spell, read print or writing, tell the time of day, or day of the month. He could distinguish colors, was a good arithmetician, could discharge a loaded cannon, tell a hidden card in a pack, and jump through a hoop, all for twenty-five cents."